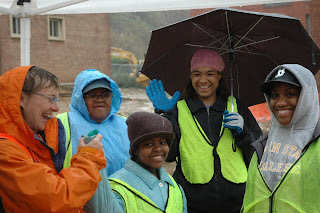 While some of you were cozy in bed this morning watching the rain through your window, Casey Trees and residents of Wheeler Terrace were getting drenched planting trees on the grounds of their 113-unit complex. As luck would have it, the sun came out as soon as the last tree was planted. Still worth it. A lot is happening at Wheeler Terrace. The public housing complex located on Valley Avenue in southeast is undergoing a $32-million green renovation - the first in the District. Casey Trees is stewarding the property's treescaping design plan and with volunteer support will be planting over 30 trees to help with stormwater management and cooling and to help create inviting common areas for residents to enjoy. Stay tuned on Wheeler Terrace - we'll be back to plant six more trees on-site this spring and the remainder this fall. WHAT DOES .40" OF RAIN LOOK LIKE?